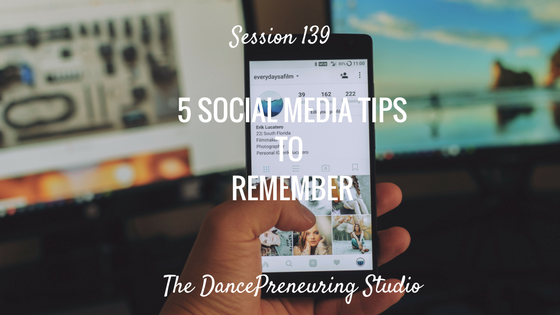 In the latest session of The DancePreneuring Studio, I share 5 social media tips that will help you be intentional about your presence and purpose on the platforms that you choose. Any strategies and tactics that you use are subject to many factors, and you have to be okay, that with anything, you need to experiment and adjust if necessary. Step to Success: A step to your success is anything that moves your life and your business forward. Whether it’s an app, a book or an idea, you can apply something today that can help you succeed. Today’s step to success is a task management tool that keeps you focused on one task at a time called Hello Focus. Freestyle Flow: You know what they say about the word assume. We all do it and I share my recent experience at a dance studio about an assumption that a woman made about me. Focus on building your own platform with your own domain. The platforms are owned by others, which means they can change the deal at anytime. For example, I know many people that have had posts blocked, accounts deleted, etc. The same can go for specific types of businesses. Bottom line is to not put all of your eggs in one basket. Determine the purpose of your post. Is it to add value? Are you wanting to generate sales or another call to action? Add value before asking for a transaction. This is especially important if you’re selling something. Pay attention to what is working for you. It might not be the same as it is for others. Balance live posting with scheduling your posts via tools. There is a time and place for automation.